Son Tae Young (손태영), Go Jun Hee (고준희)), Kim Yubin (김유빈) and model, Kang So Young (강소영) attended Maison Martin Margiela for H&M launch party and pre-shopping event held in Seoul, South Korea on November 13, 2012. 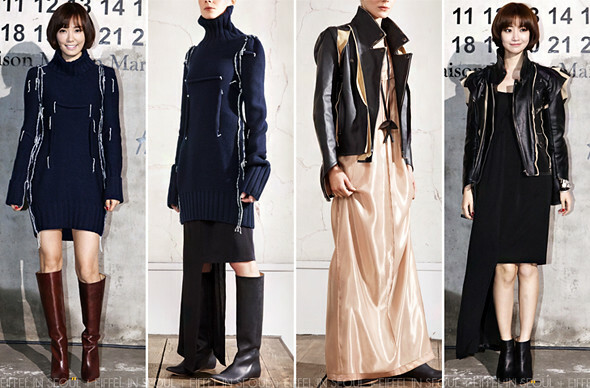 Son Tae Young (손태영) wore a navy wool jumper from the collection, styling her look with a pair of brown plexi boots. Go Jun Hee (고준희) wore an inside-out leather jacket with an asymmetric dress. Completing her edgy look with a pair of black plexi boots. Kim Yubin (김유빈) wore a leather dress with a brown suede outerwear. She accessorized her look with necklace, bracelet, clutch and boots from the collection. 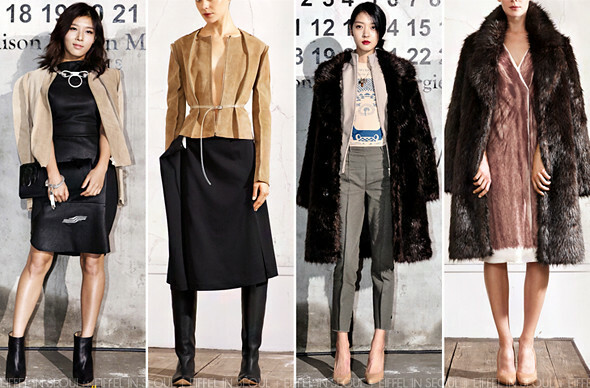 Kang So Young (강소영) wore a total of four pieces of garments from the collection. Son Tae Young (손태영) was my best dressed at this event, the dress matches those lovely brown leather plexi wedge boots. Kang So Young (강소영) was equally stylish. However, I don't like the fur coat on her. Have anyone gotten anything from the collection? I managed to score the 'Candy Wrapper' on eBay! I also loved the two watch bracelets from the mens' accessories.